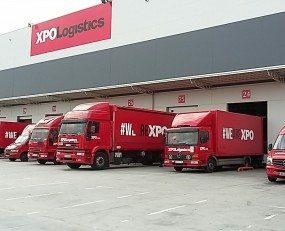 US-headquartered XPO Logistics turned in another record year, its annual results revealed on Wednesday, at a time when its stock – boosted by takeover rumours since the end of 2017 – remains just 8% below the record high of $98.3 that it reached on 23 January. Recent weakness was mainly due to the broader volatility that hit markets this week, and its valuation could shoot much higher if the company meets its targets, as it has done in recent years. This $10.8bn-market-cap overland transport and contract logistics firm reported fourth-quarter earnings that were above expectations, reaffirming its adjusted EBITDA target of at least $1.6bn for 2018 and upping its 2017-2018 cumulative free cash flow projections to approximately $1bn from $900m previously, which also followed lower maintenance capex requirements. Total group revenues stood at $15.3bn, up 4.7% from $14.6bn, while consolidated operating income rose 27.6% to $623m, meaning its 4% underlying operating margin rose 70 basis points from 3.3% in 2016 – which is the first year in which all its acquisitions were consolidated into the company and means we are finally able to make some like-for-like unadjusted comparisons. So, net income rose to $340m (2016: $69m), but adjusted net income attributable to common shareholders for 2017 was lower, at $248.5m, compared with $121.5m one year earlier. Adjusted earnings per diluted share was $1.95 for 2017, against $1 in 2016, based on a slightly higher share count. The company is showing great financial discipline in managing its direct and indirect cost base, with costs of transportation and operating expenses ($13bn on a combined basis) down to 51% and 15.3% as a percentage of gross revenues, respectively, from 53.4% and 31% one year earlier. Meanwhile, $1.6bn of selling, general and administrative expenses were flat on a comparable basis, but down over 100 basis points as a percentage of sales. Fourth-quarter trends were also encouraging, showing strong organic growth. Core transportation activities turned over $2.67bn against $2.33bn one year earlier (+14.5%), with growth led by “increases in North American freight brokerage and last mile, European brokerage and UK dedicated truckload”, it said. Meanwhile, its logistics unit grew at a similar speed, as it generated $1.57bn in Q4 sales, up 13.7% from $1.38bn one year earlier, given strong demand for contract logistics both in Europe and North America, “partially offset by a decline in managed transportation revenue in North America”. Its balance sheet is in good order. Given its annual cash and debt positions, its forward net leverage (net debt/adjusted EBITDA) is manageable at 2.6 times, as debts are falling, and cash balances are rising. The rise in operating cash flow was hindered by working capital, with cash outflows from changes in receivables at -$320m (2016: -$153m), only partly offset by $140.1m of cash inflows from changes in payables (2016: $1.7m). Excluding proceeds from disposals, its free cash flow more than doubled to $295m from $142m in 2016, for a respectable free cash flow yield of 2.7%. Assuming a constant free cash flow yield, and based on its forward free cash flow guidance, XPO’s market value would more than double to $25bn in the next 12 months. That is something incumbents and would-be suitors may want to consider.